The Mystery of the Stolen Boxcar: Henry, Jessie, Violet, and Benny used to live alone in a boxcar. Now they have a home with their grandfather, and they're fixing up their boxcar so they can ride it in the big Greenfield Founder's Day parade. There's just one problem: Someone has stolen the boxcar ... with their dog, Watch, in it! If only they can find the missing boxcar, it will lead them to Watch. Can the Boxcar Children solve their most important mystery ever? The Mystery in the Cave: The Boxcar Children are going on vacation to Dragon's Mouth Cavern. The four Aldens like rock hunting in the area, until Benny finds a sinkhole that leads to the underground caves. While exploring the caves, they realize that someone doesn't want them there. But why? Can the Boxcar Children solve this new underground mystery? 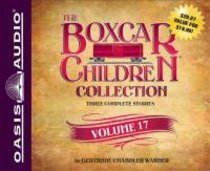 About "Bcca (Unabridged, 6 Cds) (Volume 17) (#17 in Boxcar Collection Audio Series)"
Order now to secure your copy when our stock arrives. Other edition is available. 9781613753736 0 Available. Expected to ship in 5 to 6 weeks from Australia.